Nintendo planning launch of new Wii console? Could the new Nintendo Wii pack be a different games bundle? A revamped console? Or just a new colour? Word on the net is that Nintendo could be plotting the launch of a new Wii. Codename Revolution reports that Nintendo has registered a new console, currently named 'New Pack', and that it will soon be in the hands of retailers. The universal product code (UPC) code of the new console is apparently 045496880088 compared to the original Wii which has a UPC of 0045496580018. Two digits are different. There's absolutely no clue as to what this new console will be, although it is possible to make an educated guess. 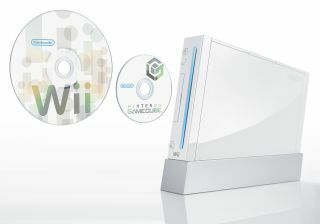 'New Pack' could be a Wii that launches with integrated DVD playback, something that's been talked about for a long time. And what with all those third party software firms making Wii software to force DVD playback, Nintendo might have decided to just ship the consoles with it included. It could also be something as mundane as a new bundle, with some new games. Or some new colours. Maybe it'll even ship with the new Wii Zapper?